Years ago, on our first trip to Europe, Morgen and I tried very hard to visit as many sites as possible on our “must-see” list, which meant very short stops and lots of travel time. Venice was one of those obligatory stops, and we were both very sad to leave after only a few days, during which we had managed to see just a tiny sliver of the city. I was impressed by the canals, the architecture, the churches, the museums, and the omnipresent music (everywhere we turned, some little chamber orchestra was playing Vivaldi)—as well as the friendly and accommodating locals. We had no real plan other than to wander around and see what there was to see—which was a shame, because with a bit more foresight we might have planned a visit to nearby Murano, the suburb responsible for keeping Venice’s finest gift shops stocked. Murano is a cluster of five small, closely spaced islands in the Venetian lagoon, less than 2 miles (about 3km) north of the city of Venice. Murano’s islands, like those of Venice, are linked by bridges and separated by canals; in fact, nearly everything about the town seems to be an extension of its much larger neighbor nearby. That in itself makes Murano an interesting and picturesque place, but it’s best known for its legendary glass craftsmen. Glassmaking in Venice dates back to at least the 10th century CE, and possibly as early as the 5th century. But by the late 1200s, the production of glass objects was the city’s major industry. Not only did Venetians produce lots of glass, they also made glass of the very finest quality. And the city’s leaders went to great lengths to protect the profitability of this industry and ensure the city’s dominance in the glass trade. A 1271 law prohibited the importation of foreign glass or the employment of foreign glassworkers. In 1291, yet another law required that all furnaces used for glassmaking be moved out of Venice proper and onto the islands of Murano. The usual reason given for this move was to minimize the danger of fire, as the city’s buildings were mostly wood. But a more likely explanation was a desire to keep the city’s glass craftsmen sequestered in a single, more easily monitored location where trade secrets could be prevented from finding their way into the wrong hands. This theory is borne out by the 1295 edict that Venetian glassmakers may not leave the city; those who attempted to leave were threatened with grievous bodily harm. On the other hand, people who worked in the glass trade were at least rewarded handsomely for their efforts. The Venetian government accorded the artisans special social and legal privileges that gave them status rivaling that of the moneyed aristocracy. This carrot-and-stick motivation worked, and glassmakers passed on their secrets to their offspring for generation after generation—giving Venice a near-monopoly in quality glass products throughout Europe that lasted for centuries. Murano glassmakers traditionally created pieces that were primarily functional rather than decorative—but with such skill and artistry that the distinction often blurred. 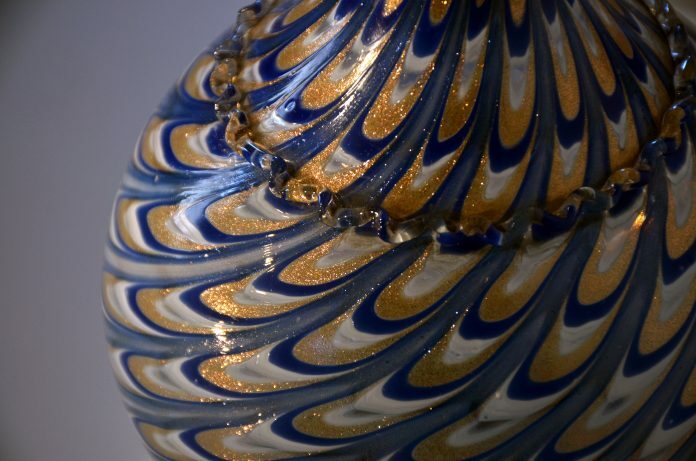 Though they were best known for their blown glass work, they also had special expertise in making mirrors and developed a number of innovative techniques, particularly involving colored glass. By the 17th century, though, Murano began to lose its mojo. A combination of political changes in Venice and technological advances elsewhere resulted in greater competitive pressure, and the Murano glass trade waned, nearly to the point of extinction. In the mid-1800s, Murano glassmaking underwent a renaissance, thanks in large part to the efforts of Antonio Salviati, a businessman who specialized in selling the glass tiles used to refurbish Venice’s many mosaics. This trend was later boosted by the tourist industry, which has kept Murano’s glassmakers busy ever since. Today, Murano glassmakers produce stunningly elaborate art pieces that sell for outrageous sums, as well as smaller decorative articles, including jewelry. But although these are the flashiest products, Murano factories also turn out mirrors, lenses, glassware, and other conventional glass items. In a town legendary for its artwork, Murano glass is the clear leader. Note: This is an updated version of an article that originally appeared on Interesting Thing of the Day on April 8, 2005.